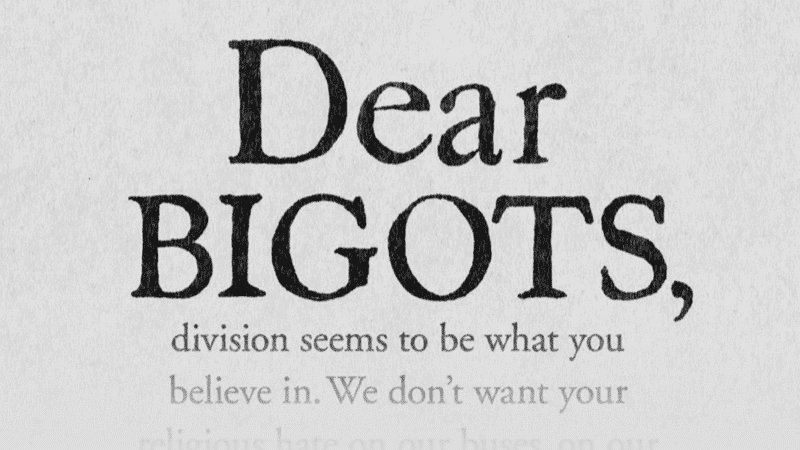 The Scottish Government’s £300,000 ‘Dear bigots’ campaign has been heavily criticised by its own ministers. The poster, part of the Government’s ‘hate crime’ campaign, appeared to brand all religious people as ‘hateful’. It has now been revealed that current and former Cabinet Secretaries have expressed concerns that the campaign particularly targeted Christians. Cabinet Secretaries including Fergus Ewing, Michael Matheson, Roseanna Cunningham, as well as junior minister Kate Forbes, wrote to the Scottish Government to complain people felt singled out by the initiative. Former cabinet minster Stewart Stevenson and a host of other MSPs raised similar concerns. Communities Secretary Aileen Campbell said the poster was “not intended to target those of faith”. She also confirmed that there are no plans to use the controversial ‘Dear bigots’ posters again.